Romill® Cold End Coating is the food grade lubricant for Vapor Hood Cold End Coating Sytstems. These systems can apply Romill® coating to the surface of newly formed glass containers as they emerge from the annealing lehr not by spraying but with a uniform horizontal vapor. Romill® supplies abrasion resistance, reduces the coefficient of fiction, improves label adhesion and reduces breakage in the production process. Romill® also can be used on hot-end treated ware, providing a very durable coating that can withstand caustic washing. Romill® Cold End Coating is a food grade non-animal product used to coat newly formed glassware at 250°F-300°F for enhanced lubricity, resistance to abrasion plus reduced coating contamination. Romill® is used full strength which assures uniformity of the coating material because it eliminates the need for mixing and the potential hazard of human error figuring ratios. No losses due to thermal shock since no liquid can come into contact with the ware. Uniform protection to all ware surfaces and smoother subsequent handling. Including bottom coating of the ware prevents bottom scratches and reduces friction between the ware and the conveyor belt resulting in fewer jam ups. Romill® is compatible with most commercially used label adhesives and can reduce customer complaints. Romill® can be applied to either hot-end treated or untreated ware. Romill® is sold in plastic one gallon containers, packed four to a box, or in 55 gallon non-returnable lined steel drums. Romill® is non-toxic with no known health effects upon ingestion and no known effects from limited exposure to the skin or eyes. Romill® is safe to handle as its flash point is 372°F. 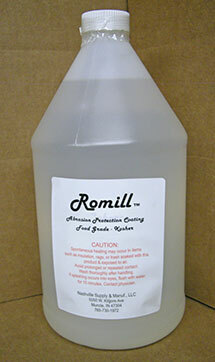 Romill® lubricant is applied with a Vapor Hood Cold End Coating System to the newly formed glass containers as they emerge from the annealing lehr. What sets Romill® Cold End Coating off from the other products? Romill® Cold End Coating is produced from the original formula created by Ball Corporation in Muncie, Indiana. Robert Miller upon retirement from Ball Corporation’s Research and Development worked with me for twenty years sharing his vast experience with the development of the Vapor Hood Coating System and the Cold End Coating. This product was named in his honor. Nashville Supply has also processed this product for other vendors for the last ten years as well as manufactured the Vapor Hood Cold End Coating System. The Nashville Supply Vapor Hood Cold End Coating Unit is a system that applies a coating of Romill® Cold End Coating to the surface of the newly formed glass containers as they emerge fromt eh annealing lehr not by spraying but witha uniform horizontal vapor. This unit is self contained, no mixing tanks, pumps, reciprocating spray guns systems that require cleaning and maintenance. The Vapor Hoods are custom to fit your particular line. Replacement parts available. Contact Larry at waxerservice@gmail.com. ©2019 Nashville Supply and Manufacturing, LLC. All Rights Reserved.